This month's art project was a page that combined travel with weaving. It took me a little thinking to figure out how to mesh these two together. Finally, inspired by my rusting and sewing, I came up with this. The front page is a sweet little vintage camper propped up on a red rock. It's parked on the bank of a lake, with red dirt on the shore...hmm, probably Lake Powell, AZ! I would love to sell it all and buy a little Airstream to live in...and of course no camper is complete without party lights! 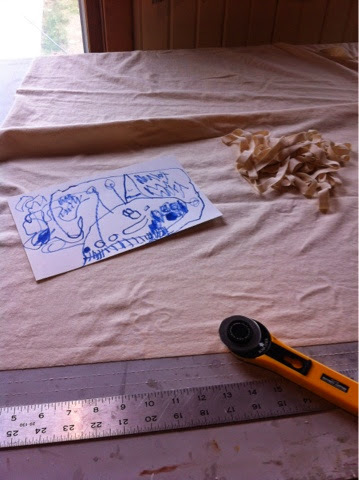 The base is watercolor paper with various fabrics (of course, some rusted) stitched and woven for the bank. The sky is painted with fluffy clouds. 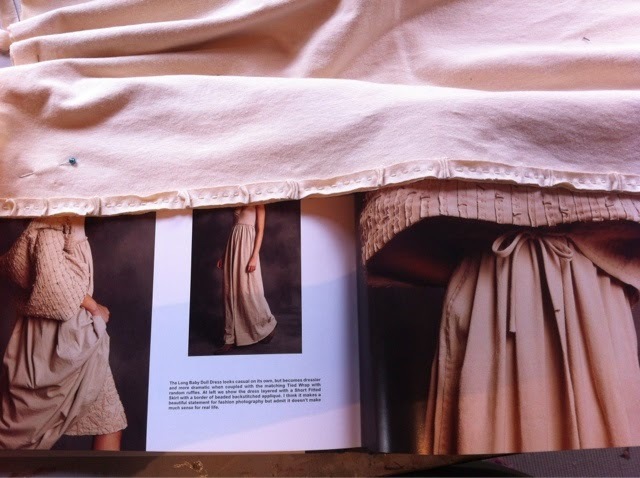 The back is woven out of rusted fabrics and hand stitched into place. The map painted is mostly the Southwest, imagine that?! Various towns are marked with yellow French knots and connected by a line of red hand stitching, and the road trip finally arrives at a destination, Zion Park, UT. Zion Park has no real significance other than it is beautiful, I haven't been there in years and would like to go back. The other locations are places I've been and loved including Flagstaff, Phoenix, Taos, Santa Fe...all the usual loves. My next page is 1950's with altered edges...I've already finished it but am saving the debut until the recipient receives the page as to not ruin the surprise! I've also been plugging away on some reverse applique. 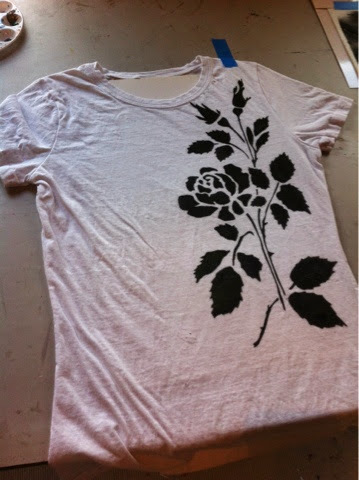 This is the Alabama Chanin rose stencil that I printed and cut, then stenciled onto the shirt. I backed it with an old favorite shirt and stitched around it with turquoise thread. Then I cut out the center of each shape. It took a while! And I'll probably never do it on an actual t-shirt again as it was more working getting my hand in and out of the shirt to find the needle than it was to sew in general. Something got into me yesterday which caused me to start tossing things into trash and giveaway bins. Some might call it "nesting", or possibly "spring cleaning fever"...or it could just be the spider that crawled over my arm as I was falling asleep the night before! If the spiders are thriving, there are too many good places for them to hide. And the reclusive brown kind adore piles, boxes and undisturbed corners. Maybe that's why we get 1-2 bats in our house every year...all the FOOD! Also, I've been chomping at the bit to start on my Alabama Chanin tied wrap embellished with "random ruffles", but my drafting board work table which is conveniently covered with Vyco (vinyl covering that is very similar to an Olfa rotary cutting mat) has been covered with things forever. I use one little foot of space to work on projects, the rest is covered with supplies, books, tools...and other projects! I cleared it off completely, put things in their proper places, wiped it down (twice) and in the past two days I've gotten so many projects going that now I want my whole house to be empty like that! I stenciled a shirt that I'll be doing reverse appliqué upon (and started sewing already) in addition to starting to cut rectangles for another shawl project. 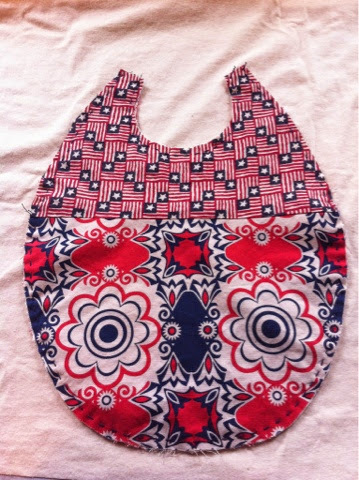 And, I cut and hand-sewed a bib as well. It's recycled fabric from a crazy ugly 4th of July themed jacket I acquired last summer. It took a long time, as I'm still learning the technique, but I got ONE STRIP sewn onto my wrap, only 47 to go! Maybe this fall I'll be finished with it?! 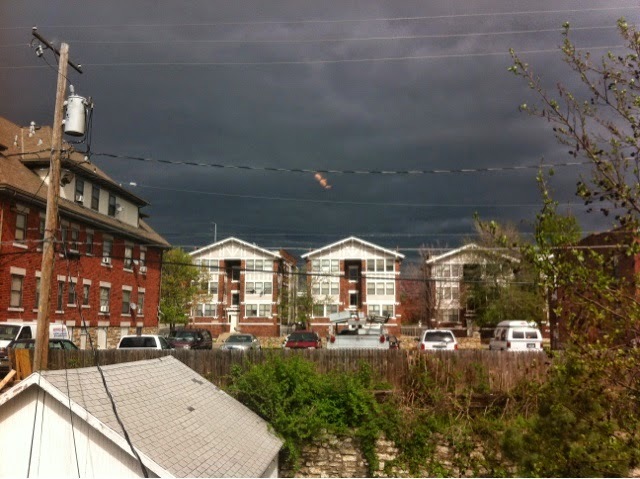 It's an easy choice to stay inside and sew all day when the sky looks ominous like this. But hopefully the warm and sunny muggy parts of spring are coming soon...as I've got tomato plants to get into the ground!